Extreme hardness, resistance to weathering, high density, wear resistance, thermal conductivity, high stiffness, chemical resistance and compressive strength all put this ceramic in high demand even in comparison with other ceramics. Aluminum oxides offer up to twenty times the thermal conductivity of most other oxides. Many qualities of alumina ceramic, including its abrasive grains, make it perfect for applications such as metalizing, plating and welding operations. Sand blasting, polishing and surface preparation are other uses of alumina. It is one of the most common pre-finishes for wood flooring due to its protective qualities. Many industries from automotive to medical to aerospace utilize the durability of this material for any number of applications such as engine components and even prosthetic limbs. The strength of alumina is demonstrated by its frequent use in the production of ceramic armor. Although ceramics in general are often more expensive than metal options, alumina is one of the most cost effective ceramics available and still provides the product longevity to outlast many metals. As do all ceramics, alumina starts as a granular powder that may be used in its pure form, but is most often mixed with other stabilizers that are chosen based on the advantageous attributes they can contribute. Zirconia, for example, is often added to increase fracture toughness. Pure alumina is white, though additional components, such as manganese oxide, may cause color changes in the final product. This formula is then manufactured by means of slip casting, pressing, extrusion, or injection molding processes used to form the desired product. 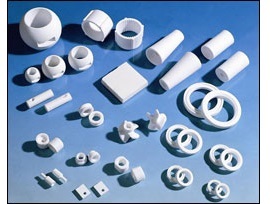 Despite the many benefits of alumina ceramic, it is more limited than its metal, polymer and rubber counterparts in ways that it can be manufactured. Alumina cannot be blown, stretched, thermoformed or forged, as these processes may cause it to be brittle and leave it susceptible to breakages. Categorized by phase and grade, the choice of a specific aluminum oxide depends largely on its use. Smelter grade, for example, is used in one of the most common alumina applications, the manufacture of aluminum metal. Calcined, low soda, reactive, tabular, fused and high purity are other phase options used in a variety of industrial applications. 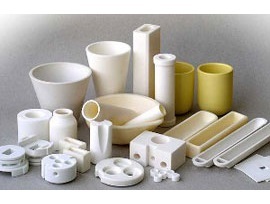 Alumina Ceramic Alumina ceramic, or aluminum oxide, is an extremely durable and cost effective option used in many industrial and commercial applications. The strong ionic interatomic bonding of alumina provides it with many attributes desirable in ceramic production.